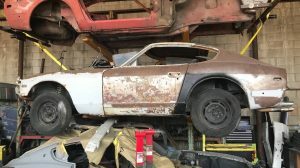 Seeing a classic like this 1967 Chevrolet Camaro SS/RS Convertible reduced to its current state is nearly enough to make a grown man weep. In its glory days this would have been one tough car, but today it is a shadow of its former self. The owner has decided to move it on, so the car, located in Lynbrook, New York, is listed for sale here on eBay. Bidding has currently reached $2,650 in this No Reserve auction, although the car is being sold without a title. 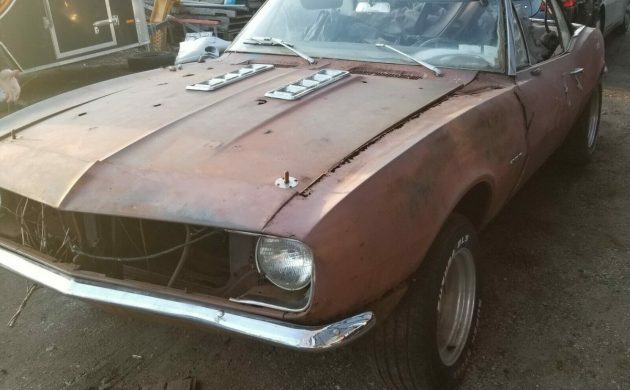 The first problem to consider is the amount of rust that is present in the Camaro. It’s everywhere, from the floors to the trunk pan, and virtually every body panel. 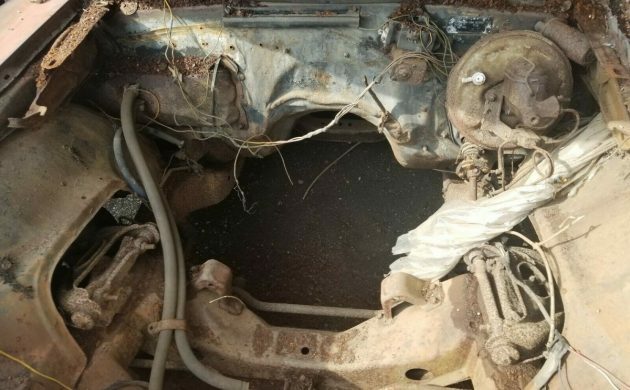 The owner doesn’t provide any information about the state of the frame, but the photo of the underside of the car also doesn’t look terribly promising. It’s also worth noting that the wheels and tires that are currently fitted to the car are not included in the sale. 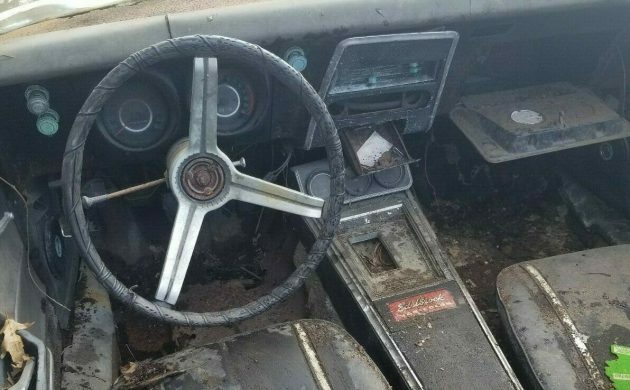 The interior shots may provide some insight into why things look so bad for the Camaro. It looks like it has been wet in there, and I suspect that it has been wet for quite a considerable period of time. The coating of wonderful green verdigris on some of the metal controls seems to confirm this fact. If I can find any positives to mention, it’s the fact that the interior is essentially complete, although there will be quite a few items that will no longer be serviceable. That green coating on the controls certainly doesn’t augur well for any electrical components or wiring, which have probably suffered the same fate. Once upon a time the engine bay used to be home to a 325hp 396ci V8, which was hooked to a 4-speed manual transmission. It no longer is, and the engine and transmission are long gone. One bright note is that the original 12-bolt Posi rear end is still present. Another positive is that the hood louvers and headlight covers are in good condition, and there is a spare set of louvers included in the sale. It probably seems like a small consolation when you’re faced with an empty engine bay, but I guess that it is something. 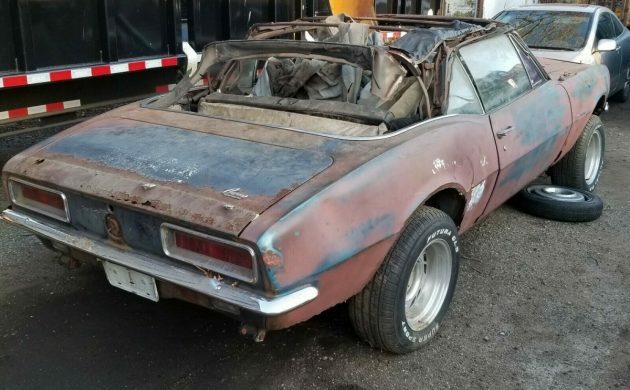 This 1967 Camaro Convertible would certainly require a lot of work before it was even close to being ready to hit the road again. There will be plenty of readers who will say that it is a lost cause and that it is, at best, suitable for parts only. But before you write it off as a bad thing, just consider this: The car was originally listed with an opening bid of $100. There have been 6 people who have submitted a total of 21 bids to get the price to where it currently stands. There are also currently 99 people watching the auction. It seems that someone sees some potential here. Interesting that you see good 68 hood louvers on a 67 as a positive. Looks like the 12 bolt rear end and the trim tag might be the only things of value here. This would have been a beautiful car when new. Someone studied the option list before it was ordered. 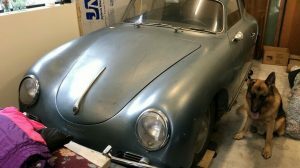 A savvy restorer will never consider a Dynacorn body, there are differences between them and original bodies. 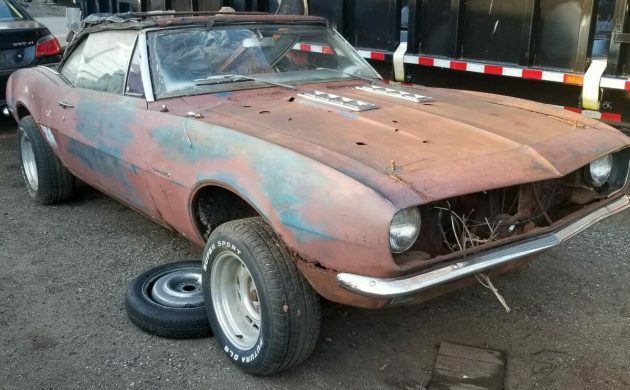 If this car is re-bodied, someone will start with an original 67 convertible body. If this car ever sees the open market after it’s restored, expect to see words such as “correct” and “date coded” throughout the ad. Alright. A rear end. And some louvers. 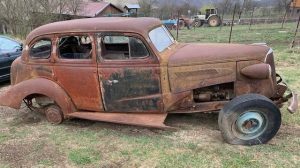 A parts car? You forgot trim tag, VIN and gauges. Parts car. N.Y not a title state until 73. This pile looks like he found it out of a field somewhere where its sat for 30 years , slapped a set of wheels on it and towed it home. He could at least have pulled the bush that had grown up between the bumpers . The rear spoiler looks like it was recently removed , maybe the guy bought the car for that and whatever drivetrain parts that were still in the car and now is trying to sell the rest. With all the reproduction parts available for Camaros I don’t even think its worth it for parts. I hope the Christmas tree air freshener on the front seat sells the car!!!! Is it getting so desperate that we have to bid on a car like this? Over 3000 and still 8 days to go. Wow! I had a 68 RS/SS convertible, 396 / Auto, white with black top and black interior. I paid $1,325.00 for it used in 71. I didn’t care for the convertible and sold it to a friend, the one car I should have hung on to for financial gain as it was immaculate. The feature car is nothing more than a parts car and the current bid is as high as I would pay even for that. Rent a backhoe, say a prayer over the carcass, and give it a dignified burial. Sometimes you just have to let it go. 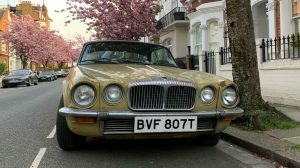 These are the absolutely one of the easiest cars to restore……parts are available to bring back to original. Also easy cars to resto mod lots of aftermarket parts are also available. I believe they hold there value a little better then my mustang convertible. I do like my 67 mustang convertible however a good friend of mine has one of these and I have driven his car and he has driven mine. I hate to admit it however they do ride and handle better then the mustangs and with the front subframe the cars feel much more solid they just seem to have a little better overall build quality.